I've given other diary examples before, such as these from September. It's a fantastic idea that not only offers writing practice, but promotes independent thought and experience on how to formulate and express those thoughts in writing (a skill that many college kids in America don't have; back when I was in college and being a computer geek with access to a printer at a time when it was rare, I used to type my friends' reports for them, and without exception their writing was horrid). 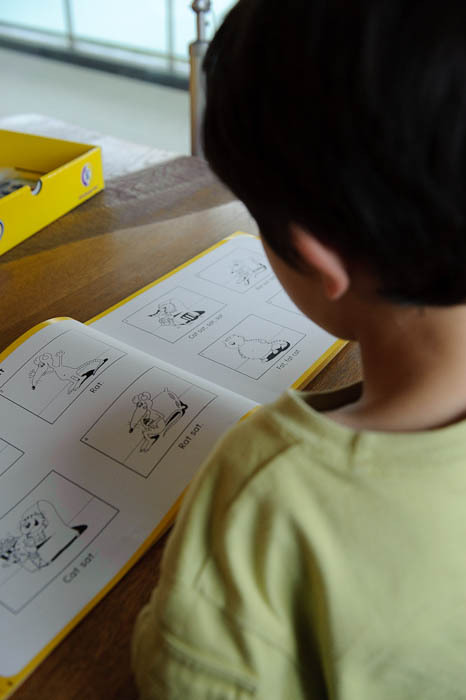 As I wrote four years ago in “How to Raise a Bilingual Child”, I've taken a very soft approach with Anthony's English, knowing that it's the subordinate language of his environment and that he could get by perfectly well even if he snubbed his nose at learning it. The soft approach and yearly visits to The States have turned out very well, and he's as fluent in English speech and comprehension as any of his peers in America. Reading and writing are a different matter. I've been very gingerly pushing the idea of him learning to read English more, but he's not been receptive to it at all. This, combined with an innate laziness on my part and a crushing amount of other stuff on my plate, and it's something I've let slip just a bit too long. So it turns out today that 14 of 30 kids in his class stayed home with the swine flu, so the school canceled his class for the rest of the week and he came home early. I decided to use the opportunity to try English reading again, and when he said he wanted to play a computer game, I suggested that he could play as long as he wanted..... but that we'd sit with the English stuff for an equal amount of time once he was done. An hour 11 minutes later he decided he was done with the game, so I pulled out a Hooked on Phonics set I had bought years ago, targeted at teaching a kindergartener to read. The first few pages are just to make sure the kid can recognize all the letters and the sounds they make, and he struggled even with that. It's something Anthony's two oldest cousins could already do at age three, but, then again, they had only one language to deal with. After a half hour he was getting frustrated (and who blames him... it's not fun), so we paused for a snack, and then tried again, and it was much easier. Then we could finally move to the real stuff, where he could learn real words (at, cat, hat, mat, bat, fat, etc.). After two pages of that, suddenly, there was a story... a two page story, and he could read the whole thing by himself. He also read the story to Mommy, which is when I took the lead picture of this post. 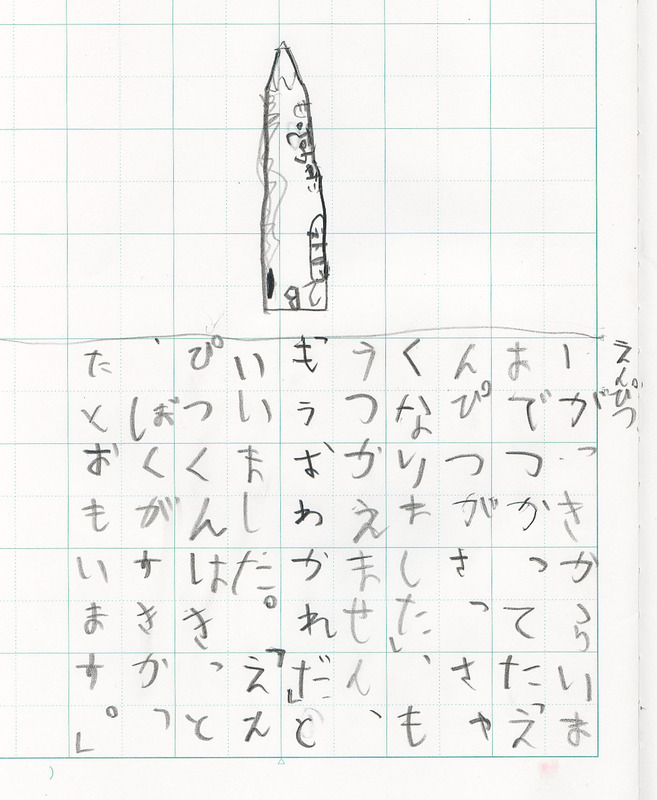 It reads: “Today while studying English, for the first time I could suddenly read a bit. From now I'll read the book. 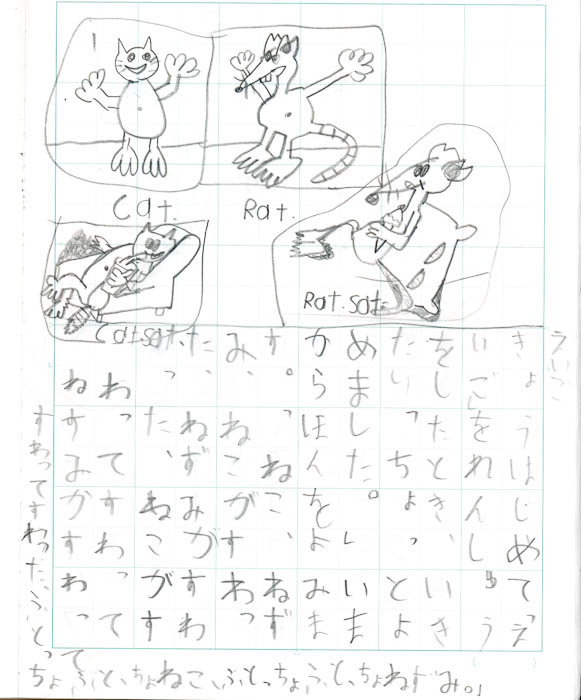 (That is, he'll now transcribe the story, which he then did – with a minor Japanese misspelling – in its entirety). So proud of him, even if he did get a lot of help from George. Another world opens up before him. Remember the little “Treasure Hunts” …i.e… “Look on the Bed” or “Look in the Tub” or “Look under the Table” that we used to do with you? The prospect at finding a little treat at the end of these progressively harder and longer “hunts” spurred you on to becoming the good readers you are now. Hmm bilingual in Canada usually means English and Quebecois, or English and Italian, very rarely English and Spanish, or more so here, English and Mandarin, or English and Korean. English and Japanese, now that is different! Guess my own question is the languages of Japanese and Chinese use symbols, are the languages similar; that is if somebody understand or speaks one, they may be able to understand the other more easily? 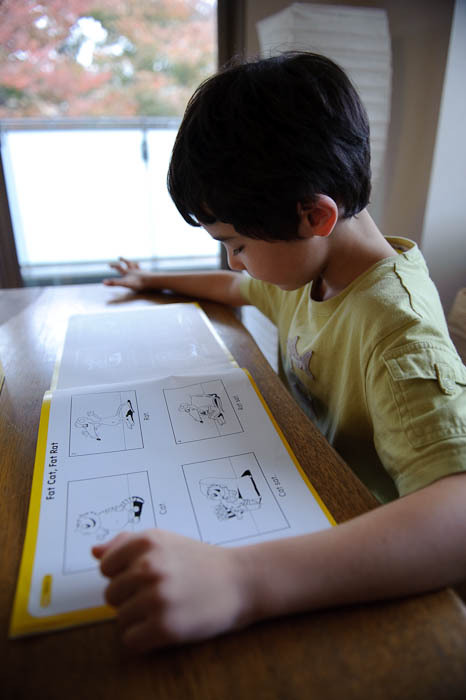 I used “Hooked on Phonics” to teach my kids to read many years ago. In fact, I recognized the book before I read your post. Love the diary entry after reading the book! Anthony is quite the artist! Grandma Friedl: Can you tell us more about the little “Treasure Hunts” It sounds very good to apply to my child. I am a very good reader but he is not. Well, Griselda, I expect Jeff and/or any of his siblings could tell you what they remember about them and do a better job, but the “Treasure Hunts” were a gimmick we employed that worked beautifully and really motivated the children to WANT to read. I would hide a tiny “treasure”…maybe a stick of gum, a small piece of candy..something very small to start with. Then they would have to read the printed clue: “Look under the bed.” If they figured it out, they would find the treasure. But as they improved, the hunts got more complicated. Instead of a treat, there might be a piece of paper with another clue that might send them to “Look in the toy box, then “Look under the Teddy Bear” The longer the hunt, the more clues, the more they semed to like it. The clues involved became more complicated :”Is there something hiding in the bath tub?”, the bigger the prize…maybe a small toy or a little candy bar. or a note that said we were going to a movie. There was really not a lot of pressure because nothing happened if they didn’t read it..there was just no reward. I recall the older ones making up little hunts for the younger ones. I smile at the nice memories. They all read early. Does this help? Thanks for asking. I for one vividly recall the treasure hunts Mom used to make for us, and am planning to use them as Anthony’s cousin Grace starts to show interest in reading. I hope you do one for Anthony – and document it with smashing photos! And I’m LOVING Anthony’s art work! I particularly dig the rat. Great work, Anthony! Hi Jeffery I really admire your devotion to raising Anthony. Unfortunately not all children have that kind of devotion in their lives. I just found out I’m going to become a dad. Am I excited!!!!!!! YES!!!! So I’m trying to learn as much as I can since my wife is Japanese and I’m Canadian living in Tokyo. One of my concerns since we are living in Japan is how a “Half” will be accepted in Elementary and High School. but in Japanese society there seems to be a stronger need to fit in and not stand out. I can’t afford to send my child to an International school so that isn’t an option. 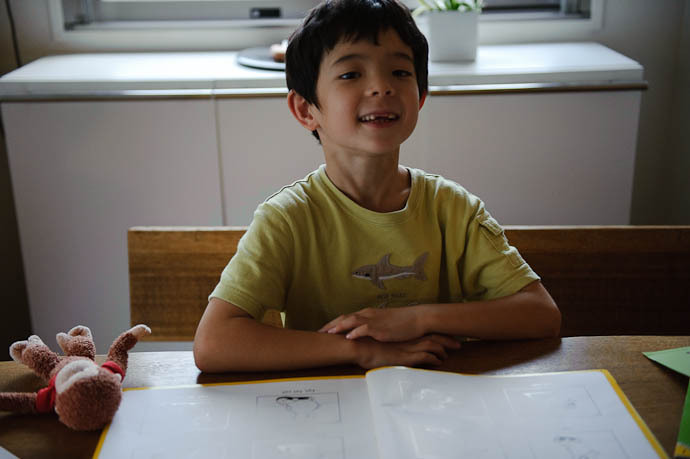 You have chosen purposely to send Anthony to a Japanese public school and I understand your thinking but will he be accepted as Japanese? I personally love Japan and its great people and the safety it provides but I also know that most Japanese are worked to death without too much protest and its still a man’s world. One other question how is Anthony’s English? Speaking and Listening. Sorry for the long “comment” My best to the proud grandmother and to you.